Vinnie and Dimebag's father was Jerry Abbott, a successful country songwriter whose tunes were recorded by the likes of Emmylou Harris and Freddy Fender. Ten years after Dimebag's death, Jerry Abbott released a book, "Over My Left Shoulder: The Life And Times Of Jerry Abbott". 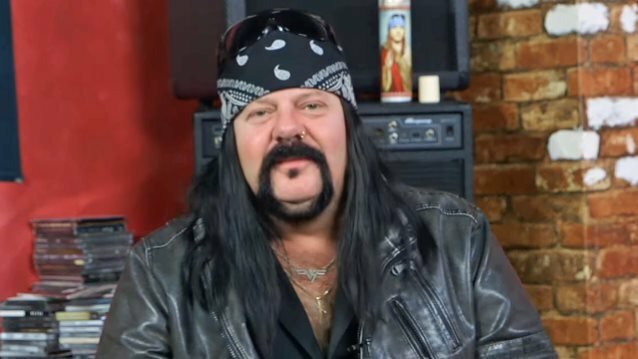 Writing about the breakup of PANTERA, Jerry, who, by his own admission, had "very little contact" with his sons "from the time [the band] began their world tour in support of 'Cowboys From Hell' until they began recording 'Far Beyond Driven'," said: "Too much success can breed failure and often does. I think that's an accurate assessment of what happened to PANTERA. It's like a marriage that's just too good to believe, and the next thing you know it's on the rocks." Vinnie told Metal Hammer that having a parent who was a music songwriter and producer made it easier for him to explore his creativity. "Yes, and especially for Dime too," he said. "My mom and dad separated when he was 14, and every Wednesday and Thursday, he would go to my dad's house and he would pick one or two songs that we wanted to learn as a band and my dad would pick the notes out and teach them to Dime. Eventually he could pick them out on his own but it really helped him out. My dad was definitely an influence on him in the early days." Sad and unexpected news back then, now Pantera has became a legend in the metal industry.